Junior year is shaping up to be the best of McKenna Brady's life. After a transformative summer, McKenna is welcomed into the elite group of popular girls at Weeping Willow High, led by the gorgeous Olivia Richmond. For the first time in a long time, things are looking up. But everything changes the night of Olivia's Sweet Sixteen sleepover. Violet, the mysterious new girl in town, suggests the girls play a game during which Violet makes up elaborate, creepily specific stories about the violent ways the friends will die. Though it unsettles McKenna, it all seems harmless at the time. Until a week later, when Olivia diesexactly as Violet predicted. 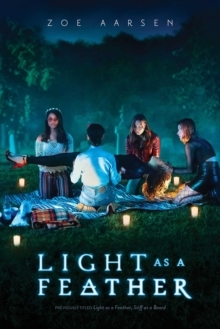 As Violet rises to popularity and steps into the life Olivia left unfinished, McKenna becomes convinced Olivia's death wasn't just a coincidence, especially when a ghost haunting her bedroom keeps leaving clues that point to Violet. With the help of her cute neighbor, Trey, McKenna pledges to get to the bottom of Violet's secrets and true intentions before it's too late. Because it's only a matter of time before more lives are lost.